A special festival of folk arts in Rajasthan promises dancing, music and local color over a few days in February. A visit to Jaisalmer during this time will ensure you witness the region’s authentic music, dance and local traditions from artistes and exponents! India’s north-western state Rajasthan is well-known for its colorful outfits, desert dunes and the annual camel festival that attracts swarms of visitors to the town of Pushkar. 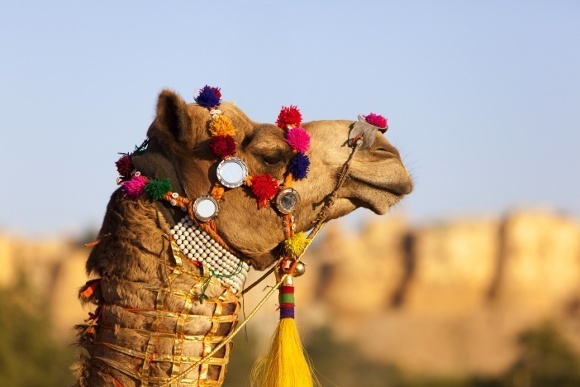 In February, Rajasthan hosts another festival, this one in the magical desert city of Jaisalmer. For three days, the dusty hues of this frontier town come alive with arts and crafts, music and dance, textiles and event contests. If you’re planning a visit to Rajasthan, we recommend you time it to coincide with this festival that showcases the best tradition and cultures of the state. Running for three days, the festival ends on a Poornima – full moon – night. Tourists to the region often have a fragmented experience of local arts: a music performance whilst dinner is served, or a dance performance unfolding by the edges of a crafts bazaar. 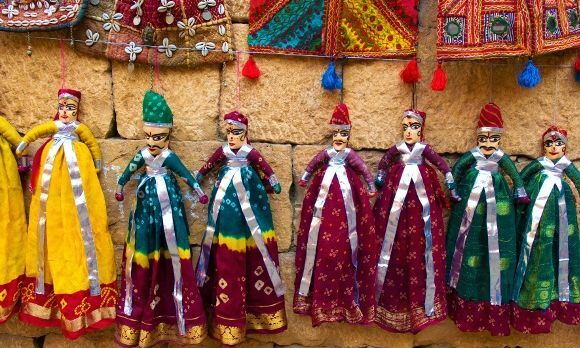 The Desert Festival of Jaisalmer brings the rich and vibrant culture of the state together at one platform so that visitors can soak in the banjara (gypsy) tunes, traditional dresses in reds and oranges, and wonderful dances evoking local legends of heorism, tragedy, love and longing. It’s not just music and dance at this Desert Festival. Other local acts include snake charmers, puppeteers, acrobats and folk performers. Whilst all of these will be completely new to visitors, the Gair and Fire dancers are expected to have a special allure, playing with fire dressed in their vibrant clothes and moving gracefully. Rajasthan’s best known and loved animal, the camel, also features prominently in the celebrations. For a state that organizes a massive camel fair in Pushkar every year, there’s no way the desert festival could take place without honoring the “ship of the desert:” the camel! Camel rides are widely available and as an indication of how much local residents value their trusted camel, these animals actively participate in several events including camel polo and the camel dance. Rajasthan, in North India, has several cultural and social exports as well; these are showcased during the festival. The classic image of the Rajasthani man is one with a deep red turban wound across his head and a majestic twirling moustache that resembles the currently popular handlebar mustache. Turbans in Punjab and Rajasthan are so popular that several Indian weddings now have a small corner devoted to “turban tying,” before the night of dancing – or sangeet – begins. At this festival, you’ll get to witness the authentic Rajasthani turban, as locals offer lessons on how to tie them, and others display their majestic moustaches. Both turbans and moustaches are symbols of honor in the state, and the art of tying and cultivating them is a significant cultural tradition. On a lighter note, a Mr Desert will be crowned, adding to the general environment of fun and entertainment. Unfolding against the backdrop of the sprawling Jaisalmer Fort, this mutli-day festival invites you to celebrate the spirit and elegance of Rajasthani folk traditions.